CHINE – Longquan - Archaeological authorities in northern Shanxi Province announced on Saturday that they have retrieved a millennium-old stone carving stolen from China's oldest existing Taoist temple. An official from the Shanxi Provincial Administration of Cultural Heritage said the stone tablet was seized after police nabbed four suspects in December and would be returned to the 1,170-year-old Guangrenwang Temple in the Longquan Village of Ruicheng County. The temple was built in the Tang Dynasty (618-907) for farmers to prey for rain from dragons, long worshipped as water gods in China. It is also the oldest surviving edifice for such religious practices. The stone carried "Records of Longquan" documenting the construction of Guangrenwang Temple and other water conservancy projects, as well as local rain-preying rituals, during the time the temple was built. The temple, however, is in a poor state of maintenance, and the stone carving was stolen in 2012, said Feng Yunlong, head of the cultural relic administration trusted with the temple's protection. Feng said funds have been secured for revamp work to begin at the site this year. 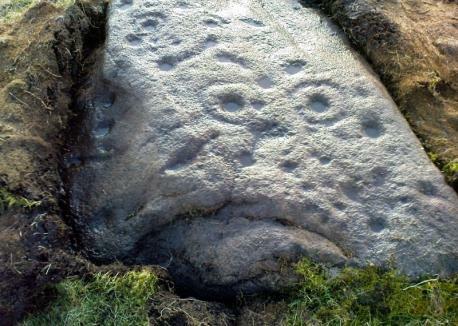 ROYAUME UNI – Burley Moor - A newly discovered collection of prehistoric markings on a Wharfedale moor has been dubbed Fraggle Rock. Local antiquarians uncovered the strange-looking stone, covered with ancient cup and rings marks, during an exploration of Burley Moor. It is one of a series of clusters of previously unrecorded carvings found by Oakworth-based Paul Bennett and fellow enthusiasts Paul Hornby and Michala Potts. “We called it the Fraggle Rock after noticing that, when you look from one end, the two main cup-and-rings are like two large eyes carved above a large, natural down-turning ‘mouth’ feature - similar to some of the creatures’ faces on the Muppets, or Fraggle Rock. “The main design consists of at least three cup and rings, two partial cup and rings, 28 cups and several carved lines, along which some cup-markings are linked to others." The group found another, faint cup-and-ring marking ten yards south of the spot and a “fascinating cup-and-lines stone, with at least four long carved ridges running like hair from the top of the stone into the earth”, 20 yards to the west. The Fraggle Rock stone is just the latest in a line of artefacts that have been discovered by the group.